In Mexico, grilled steak entices: Mouth-watering charcoal-seared meat, tongue-tingling roasted jalapeño and zesty fresh lime. 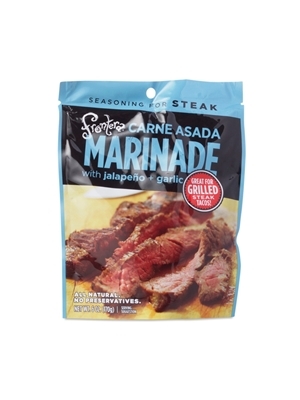 Frontera Carne Asada Marinade let's you serve up tasty food with casual confidence. Lime juice from concentrate, white wine vinegar, expeller pressed canola oil, garlic, onion, salt, natural Worcestershire sauce (distilled vinegar, molasses, natural corn syrup, water, salt, caramel color, sugar, spices, anchovies, natural flavor and tamarind), jalapeño, paprika, xanthan gum, spices. ALL NATURAL. NO PRESERVATIVES. CONTAINS FISH. No gluten ingredients used.